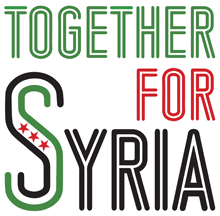 Syria Solidarity UK have been directly involved in putting together the following emergency appeal. We know the people running the school in Aleppo and the people fundraising in the UK. We have been in ongoing contact with people in Aleppo over several months. Even as they face the horror of constant bombing and the anxiety of increased food shortages, one of our key contacts has been working on funding for this school. 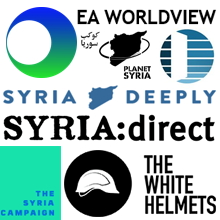 Established funders we have been speaking to won’t take it on because Aleppo is high risk and therefore falls outside their guidelines for funding. Being in besieged east Aleppo there is of course no safe school option for these children, but they still need an education as well as protection from bombs and food to eat. 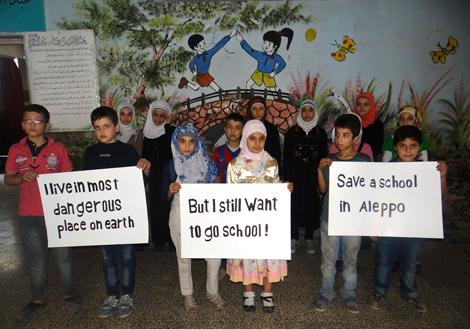 We at Human Care Syria have been approached with this urgent request from a school in East Aleppo. The school has run out of funds to continue operating and we have decided to take on the challenge of running the school and raising the funds necessary because we understand how critical the situation is. Since the start of the Syrian crisis four million Syrian children are out of school and not receiving their basic human right to an education. What does this mean for the community around East Aleppo? This school is the only school in the area, serving 900 students (aged 5-14) in the community. If it shuts down the children will face the risk of traveling to another school, and traveling inside Aleppo is very dangerous at this present time! This will inevitably make parents keep their children at home. It will also mean a loss of jobs for teachers and maintenance staff. One year’s running cost is £49,000 (covering 28 classrooms for a double shift school).